As the youngest of three daughters by six years, I had a different mom from my sisters. She was the same person, but while I was growing up Rita Welty Bourke evolved from a stay-at-home mom to tireless writer. When I was in middle school, she converted the guest room to a writing office. She donated the full-size bed and replaced it with a desk, a PC, and two brimming bookshelves. My mom set to work creating unique and interesting stories that only she could tell. Family members (aka my dad and I) would often burst into her office with questions like, “Have you seen my shoes?” She soon placed a “do not disturb” sign on the door knob. Over the years, my mom published dozens of stories in literary magazines such as The North American Review, Cimarron Review, Louisiana Literature, Shenandoah, Witness, and the Black Warrior Review. My favorites of her works include: “The Burn Hole,” “Copperhead,” and “The Larry Brown Discovery Tour.” Also among the best stories are a series featuring the tenacious and sensitive character, Kylie Wheeler. As Kylie progresses from park ranger, to intern, to licensed vet, she wrestles with the dilemmas of her career and how to best serve animals, her profession, clients, and herself. A few years ago, I became interested in the field of book publishing. After some discussion with my mom, I encouraged her to put the Kylie stories together in a collection for self-publication. She agreed and soon polished them into an amazing book. After the words were finalized, readying the collection for print was much more work than I anticipated. 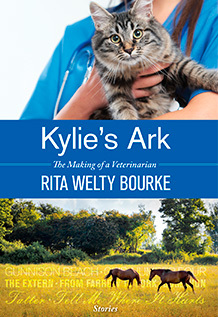 My mom and I persisted, however, and we published Kylie’s Ark: The Making of a Veterinarian, in April of this year. Along the way, family members and friends have supported us by providing ongoing feedback, a book club discussion guide, and a series of videos interviewing the author. Through the course of the project, I’ve learned countless lessons such as: 1) the importance of hiring a proofreader; 2) how to design an effective book cover, promotional marketing materials, and press release; and 3) the intricacies of producing a print book in InDesign, converting it to an e-book edition for iPad and Kindle, and uploading it all to Createspace, Amazon KDP, and iBooks. Seeing the collection on Amazon and reading all the positive reviews has made the journey worthwhile. Kylie’s Ark has garnered almost fifty 4 and 5-star reviews so far. I look forward to seeing what happens with the book and potentially future books in the years to come. If you’d like to read the first Kylie’s Ark chapter for free, sign up for my mom’s email list. As one reviewer exclaimed, “Every animal lover will be deeply moved by this collection.” Check out the full book on Amazon, iBooks, and RitaWeltyBourke.com.